Disclaimer: Compensation was provided by Eucerin via MomTrends. The opinions expressed herein are those of the author and are not indicative of the opinions of Eucerin or Momtrends. Do you ever feel like you have failed as a mom? I recently had one of those moments. I have three kids and my oldest was getting ready to take a shower. He took off his shirt and must have forgotten his towel. I stopped him in the hallway because he had eczema flare up that he didn’t tell me about. He is eleven, so he is at the age when you no longer see them running around the house half dressed. I just had no idea. I felt so bad, so I decided I needed to take action right away. I grabbed Eucerin. Since 1900, Eucerin has made healthy skin its mission. High-quality, clinically-proven formulations developed for a range of skin needs has made Eucerin an essential part of everyday skin health for over 100 years, and one of the brands dermatologists trust most. Eucerin is committed to helping consumers put the health of their skin first every day by providing skincare education and a line of proven cleansing, moisturizing and skin protection products. I had used their products before so I decided to use them again. Nothing is worse than being itchy. 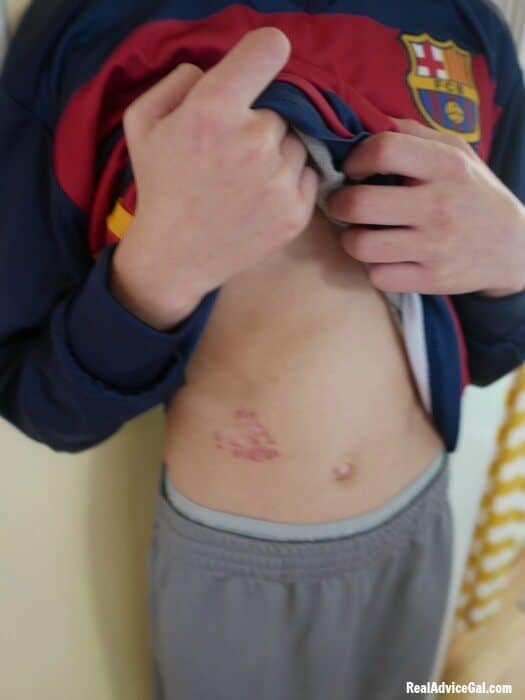 I sent my son to take a shower because that is where he was headed and I reminded him not to take too hot of a shower because that would make the flare up worse. 1) Shower every other day to lock in moisture. 2) Wash skin gently to avoid stripping natural oils out. 3) Apply Fragrance- Free moisturizer to lock in hydration like Eucerin Eczema Relief products because they are dye-free, fragrance-free, and steroid free. It will not irritate sensitive skin, and it will calm eczema and repair your skin’s protective barrier. 5) Use the right laundry soap to wash clothes and bed sheets. 6) Use a humidifier at night. 7) Eat the right food to have healthier skin like avocados, blueberries, apples, foods with ginger, zucchini, cucumbers, foods prepared with basil, and kale. You can see the difference in just 7 days. I know that I need to make sure that this doesn’t happen again by having Eucerin accessible at all times. I also know that I need to put a note on the mirror to remind my son to use it. You can lead a horse to water but getting it to drink is a whole new story. I will say since my son is no longer itchy and his flare up has resolved itself he is motivated to apply Eucerin. They say with daily care 4 out of 5 children remain flare-up free after 6 months of daily use with Eucerin Eczema Relief Body Creme. 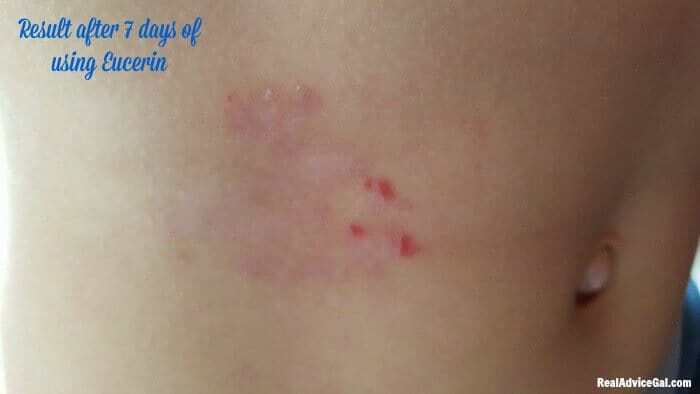 I know that my son is very active, and I hate to think that his Eczema had been holding him back. I am grateful that we were able to find him some relief and a treatment plan that he can easily implement. 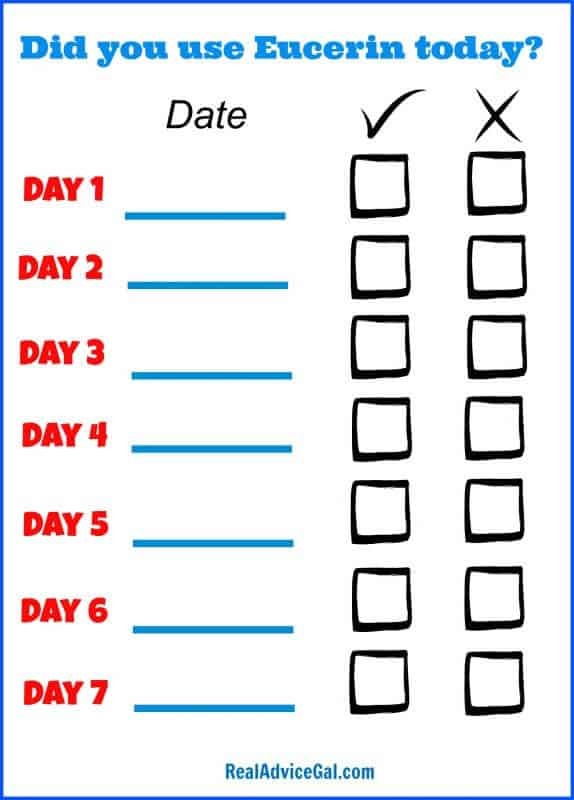 To keep track if you or your children are using Eucerin daily, get our printable checklist above. Just click the image above to open it to full size. 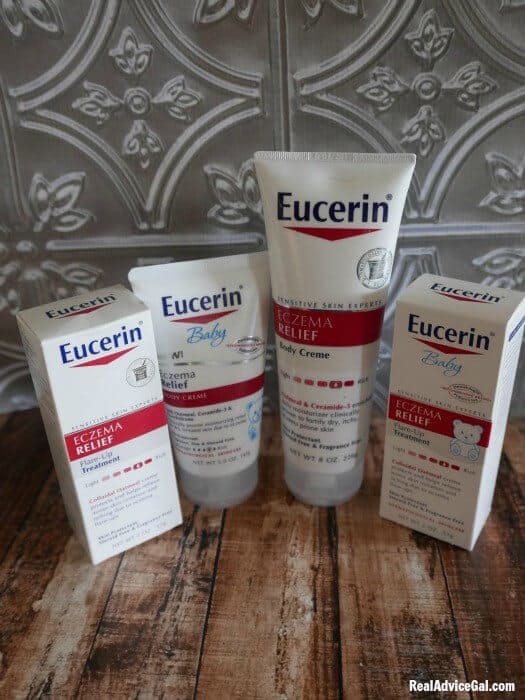 Trusted dermatologist, pediatrician, and pharmacist-recommended brand Eucerin is on a mission to show families affected by eczema that daily use of its products can help by instantly calming and relieving minor skin irritation and itching due to eczema. Make sure to check out Eucerin website to see their complete line of products.